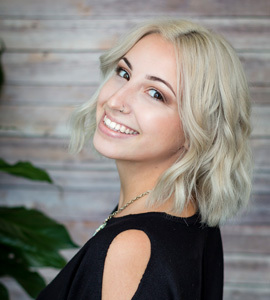 Eliana has been a member of our team since 2016 and has been a licensed stylist since 2017. She’s a detail oriented stylist and thirsty for knowledge. We actually call her our “hair nerd” because she is constantly doing research on all the products we carry. She is always looking for new trends to bring to her customers and loves to educate them on how to maintain their hair at home. When Eliana is not at the salon she loves to be outdoors hiking, kayaking or playing with her dog, Opie. Eliana services guests Tuesday 3-9, Wednesday 3-9, Thursday 9-3, Friday 2-8, most Saturdays 8-4 and every other Sunday 9-3.